Several years ago my husband and I we fortunate enough to be able to take a trip to Italy. We loved every second of our trip – the culture, the history, and especially the food! We did so much walking and hiking during the day that we had no problem indulging in the local delicacies. One of our favorite after dinner treats was gelato. I think we sampled every flavor that was available! Although we can’t get back to Italy any time soon, we are still enjoying delicious gelato courtesy of Forte High Protein Gelato. 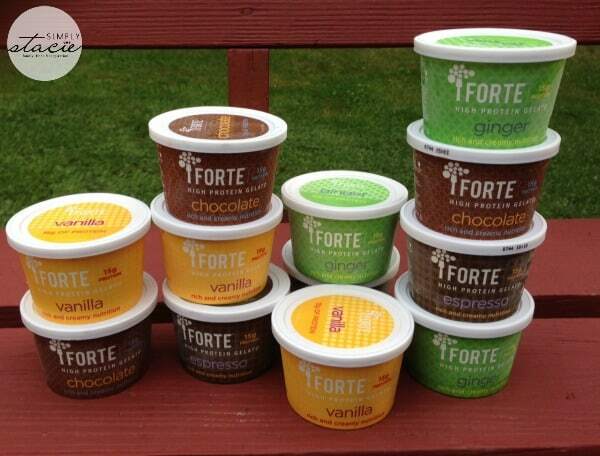 Forte sent my family a great sampling of flavors from their high protein gelato line. They included Vanilla, Chocolate, Ginger, and Espresso. Being a big coffee fan, I dove right into the espresso. If you’re a coffee lover, you will LOVE this flavor. This flavor has a great mix of Arabica espresso and sweet cream. This is by far my favorite flavor of the bunch! My husband is a big ginger fan and he found the ginger flavor gelato to be smooth and refreshing. It’s made with real organic ginger, so you’re reaping the benefits of eating ginger while enjoying a delicious treat. The vanilla and chocolate flavors are classics – the vanilla is creamy and smooth, the chocolate rich and decadent. I love that the Forte brand uses a lot of organic ingredients, and all of their flavors are low cholesterol, gluten free, and high in calcium. Each 4 fluid ounce cup contains an amazing 15 grams of protein, 2.5 grams of fat and are only 160 calories each! 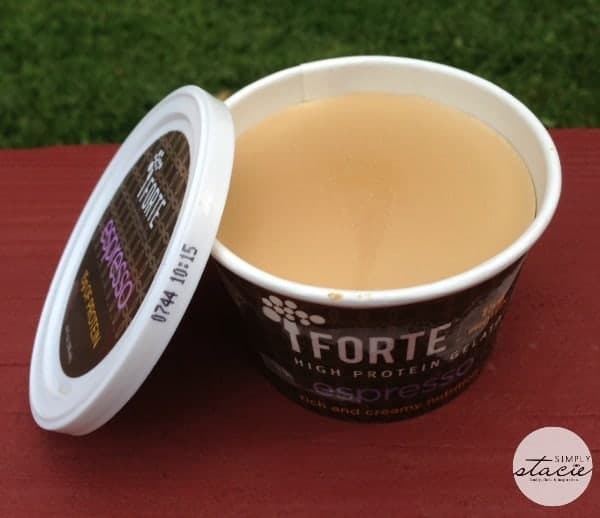 The Forte team has worked hard to transform classic Italian gelato into a perfect healthy high protein snack that you don’t have to feel guilty about. They aim to maintain the traditional style, taste, and texture of authentic Italian gelato, and I think they have done a fantastic job of it! To learn more about Forte, visit their webpage. You can also find them on Facebook, Twitter, Google+, Pinterest, and Instagram. 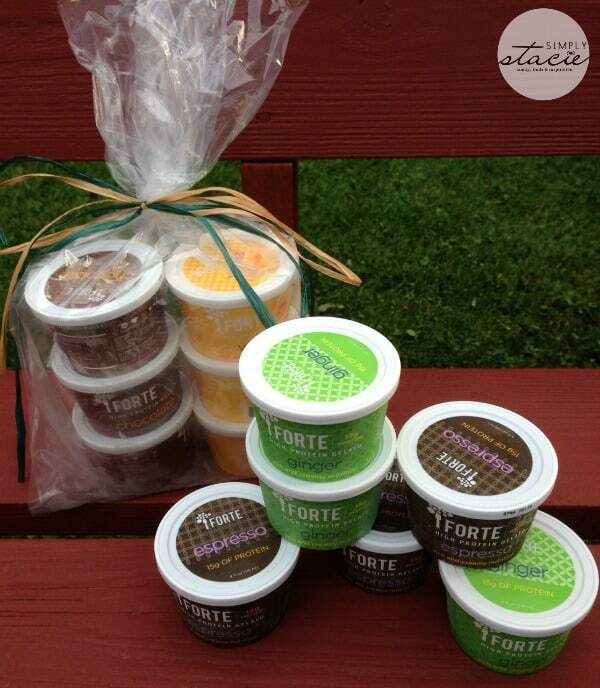 You can use their store locator to find retailers near you that carry the Forte brand. You can also shop right on their website where a 6-pack of flavors sells for $18.00. I’ve actually never tried gelato but I’ve always wanted to! Hopefully these will be in my local supermarkets soon! oh thanks i will go follow them!! I have never heard of this brand! I like that it uses a lot of organic ingredients and that there is a lot of protein in every serving. They sure sound delicious. I will have to look up this product to see where I can find it. Omg I Love Gelato! I would pick the espresso for sure, sounds yummy!! I have wanted to try this brand out, thanks for the review! I just tried Gelato for the first time a few weeks ago while I was in Myrtle Beach, Delicious!!!! This here sounds amazing and would love to try it as well!! Wow! I love anything Italian would love to try it! Looks good, have not had gelato in a long time! I’ve never tried gelato, but I really would like to! I’ve only tried gelato for the first time this summer – yum! I’ve never tried gelato, but I like that this kind is good for you! I have never had gelato before but I’d love to give this a try, the fact that this is high in protein is perfect. Thank you for sharing this post. I love Gelato, we get to eat it when it’s Heritage Fair here, delicious. Ever since I tried gelato a little over a year ago I haven’t touched “ice cream” again! I love the texture of gelato vs ice cream; the smooth, almost like a “whipped” texture, to me the THE absolute best! So far my favorite brand of gelato is Breyer’s salted caramel. Very interested in trying Forte now though! I’ve heard good things about gelato but don’t know much about it. Can’t wait for my family to try this one though. Love the high protein. My daughter needs to get more and needs high protein snacks like this. I love gelato! I’m excited to try this kind. Wow wow wow – WHAT a great idea!! I am definitely going to have to try these. Gelato is my favourite so this is the answer to being healthy and indulging! I am a coffee lover, and they sound so good. Have not seen them in the stores here, but I was not looking for them. Now I will, Thanks! These sound really good! I really like that they have more protein. I will have to look for these. Mmmm gelato! I want to try these NOW!